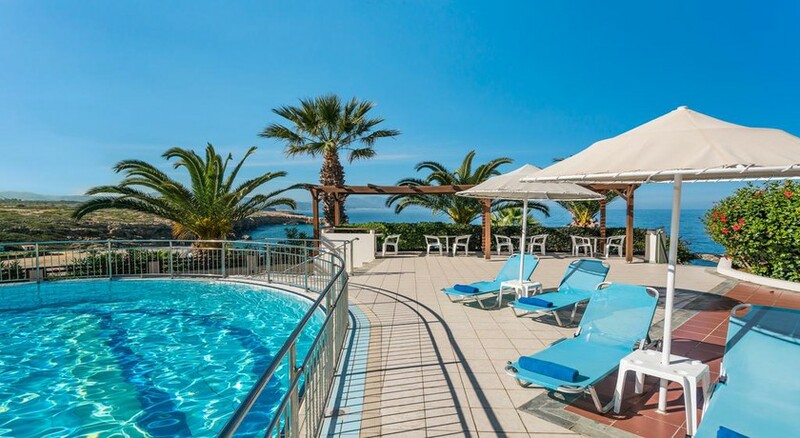 A cosy family-friendly hotel located close to two private coves and overlooking the Aegean Sea, Hotel Iberostar Creta Panaroma & Mare is a laid-back resort at just 1km from the Geropotamos Beach and 19 km from the historic Melidoni Cave. 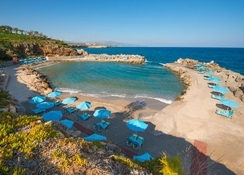 There are various well-equipped beaches here and guests can benefit the exclusive access from Hotel Iberostar Creta Panaroma & Mare to the beaches. Guests can enjoy family time here as the property boasts of a spa, six pools and awesome dining facilities. Hotel Iberostar Creta Panaroma & Mare features mini-golf and a gym along with recreation for kids as well. The laid back hotel gives a sense of serenity and tranquility to the tourists and is often thronged by people desiring some peace from the hustle and bustle of city life. 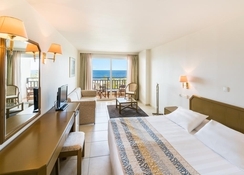 Hotel Iberostar Creta Panaroma & Mare can be reached by air via Heraklion Airport which is 65 km away. The Chania Airport is 95 km from here. Distance to Venetia Harbour is 16.3km. The beach nearby is at less than 250 m from the property. Geropotamos beach is located about 3km west of Panormo and named after the river that meets the sea here. The sandy beach has cool waters, and the estuary forms a small lake near the shore. The beach is well-organised with parasols and a small eatery offering drinks, beverages and food. The rooms are vibrant and simple. You can find free Wi-Fi facilities here and relax watching your favorite TV shows on the flat-screen TVs. The rooms are equipped with mini fridges and separate sitting areas and balconies. The upgraded rooms are equipped with sofabeds. The suites overlook the sea while the bungalows feature patios. There are upgraded bungalows too which come with living rooms. Guests can relish a breakfast buffet every morning on complimentary basis. The hotel features 3 airy restaurants including an Italian restaurant and 8 bars. The Greek tavern serves local dishes for lunch and breakfast. The music bar is open until late in the night. Hotel Iberostar Creta Panaroma & Mare also offers 4 outdoor pools and 2 kids pools. A spa, gym and mini-golf add to the fun here. Three tennis courts and a fitness room provide plenty of sporting activities for the sports freaks. Guests can pamper themselves with a massage treatment at the spa. Kids find lots of entertainment at the kid’s club here. A mini disco and animation programs specially cater to kid’s entertainment.